12x7 wrote: The best deal for an XL Kamado is from Costco for around $995. The other great Kamado deal in January was the Akorn from Bunnings for $250. They sell the saffire at cosco ? 12x7 wrote: Give Urban Griller s call. Hi guys I currently have a saffire , but thinking of adding to the ranks , does anybody know if the new saffires are sold in oz , Melbourne or is it still the old stock . http://saffiregrills.com/build-23-silver-platinum/ Is the one thinking about . Pesto3 wrote: Looks sensational mate!! Sorry no photos of ribs didn't have time they turned out amazing . I have found a butcher that cuts ribs for me , am I allowed to put his details on this site ? titch wrote: Looking good, where are the ribs hiding? 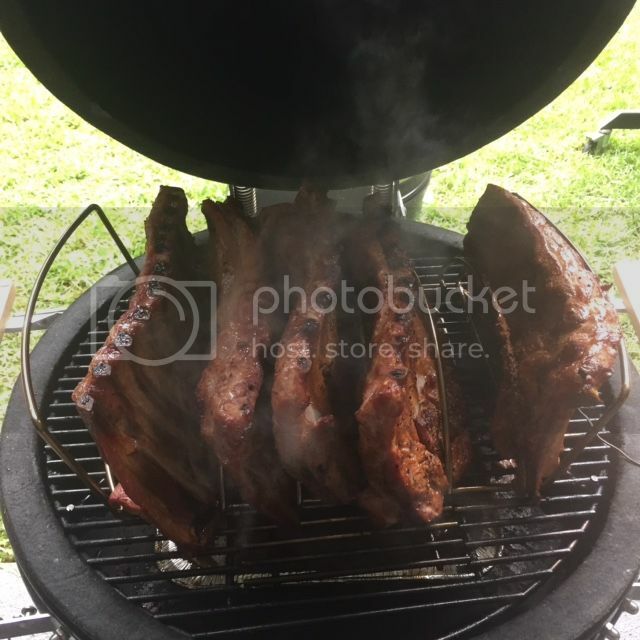 I have found that in my kamado (saffire) that the less I fill it with charcoal the better , at the start I use to fill the basket to the top , but not any more I get more air circulating with less and get up to temp quicker . Looks the goods, let's see one carved up! Didn't have a chance to take a photo as the everyone was to inpatient as I was cutting them.